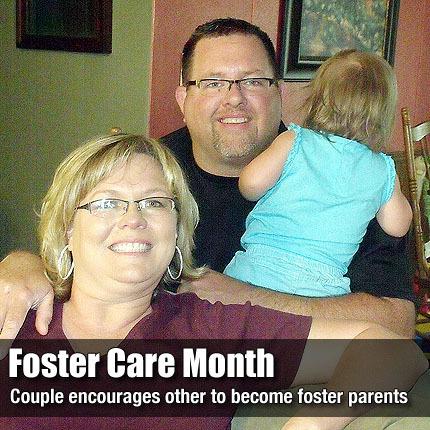 Foster parents Corey and Amy Linton, of Osage City, are in the process of adopting their foster child. Once the process is complete, the Lintons plan to foster other children. Editor’s note: The name of the child in this article is an alias to conceal her identity due to adoption regulations. OSAGE CITY—Corey and Amy Linton have been married for four years. The couple loves children, but cannot have any of their own, so about two years ago they decided the thing to do was to become foster parents. It only made sense, they said. Currently, the Lintons are in the process of adopting Charity, who came to them as a foster child when she was only three months old, more than a year ago. The Lintons know that they have made a difference in Charity’s life. And Charity has made a difference in their lives as well.